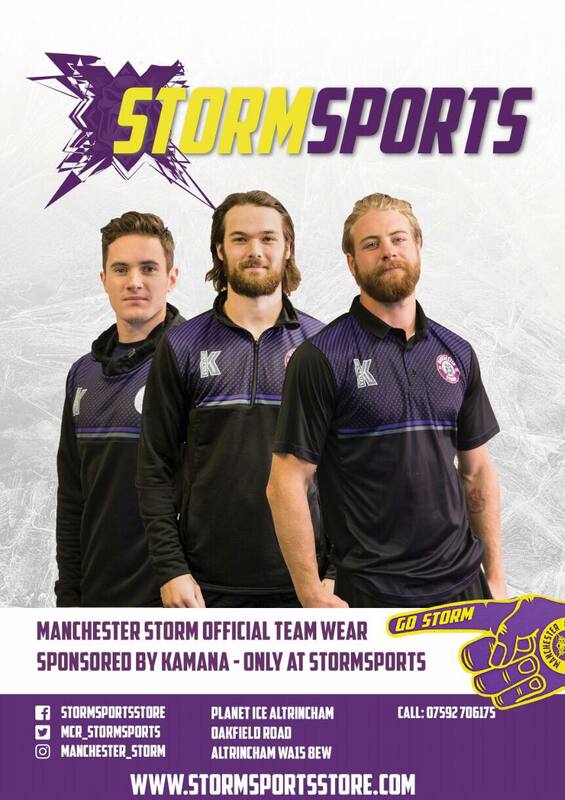 Match Report: Storm Win 4-1 in First Patton Conference Game of Season Against MK Lightning. Manchester Storm welcomed visitors, Milton Keynes Lightning for the first time of the season last night, in order to defend the Patton Conference trophy. It was also an excellent comeback for the EIHL’s leading point scorer, Mike Hammond, who went off the ice with injury during one of Storm’s preseason games. The first period went off to a good start, as Hammond got first blood, putting one through Killeen’s five-hole on an assist from Long and Richardson just 1:13 into the game. However, it was only three minutes later that Lightning equalised on a snipe scored by Meidl at 4:16. There were a few chances for both teams throughout, to be denied by the netminders. It was Storm who got the first penalty, with Richardson sitting two minutes at 7:10, for face-off violation. Storm got lucky for the second time, when Hammond scored a short-handed top shelf goal, unassisted on a breakaway. Byers was sent to the box for hooking at 8:42, with Storm on a short 5 on 3 penalty kill. Lightning’s Neiley then received two minutes for holding at 9:58. Ehrhardt took his chances towards the end of the first only to be denied on an old school save by Killeen. The second period was eventful and full of penalties, with Storm sitting the first one at 21:16 for too many men and Lightning’s, Mazanec for interference at 24:05. Lightning take their chances and put one past Ginn, for it to be reviewed and disallowed due to goalie interference. Things then started to get tense, around either end and it wasn’t long before Lightning got the first major penalty, with Valdix sitting a 2+10 for checking to the head. Ehrhardt then sat two minutes for cross-checking. 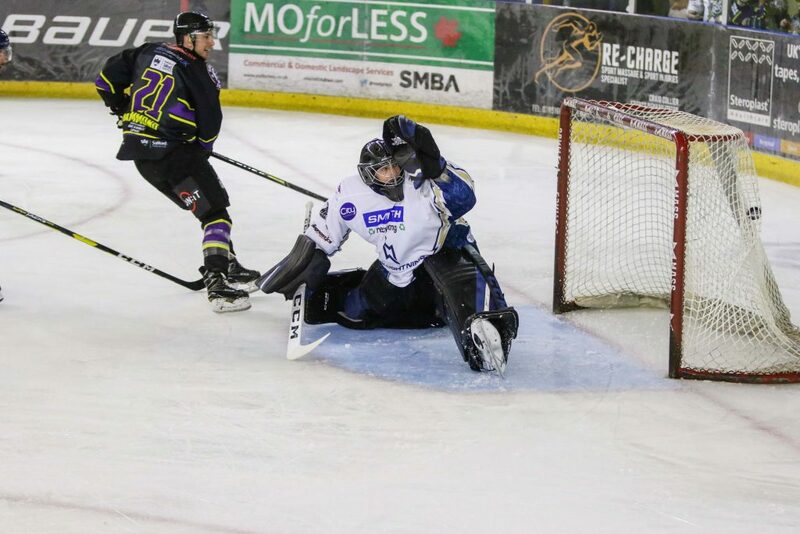 Storm’s third goal appeared in the final ten minutes of play, Moffatt realised he couldn’t quite get the breakaway and drop passed the puck, with Byers taking the goal on a rebound at 33:45. Things began to get feisty as both teams took coincidental penalties with Bakker sitting for roughing and Mazanec for interference. There’s handbags around Storm’s end, and gloves are dropped, resulting in Storm’s, Balmer and Lightning’s, Fine each sitting five minutes for fighting. It was just under a minute later when it all kicked off again, as the whistle blew signalling the end of the period. This time a line brawl, with Lightning’s, Neiley and Ruopp for Storm, both being handed five minute penalties for fighting. 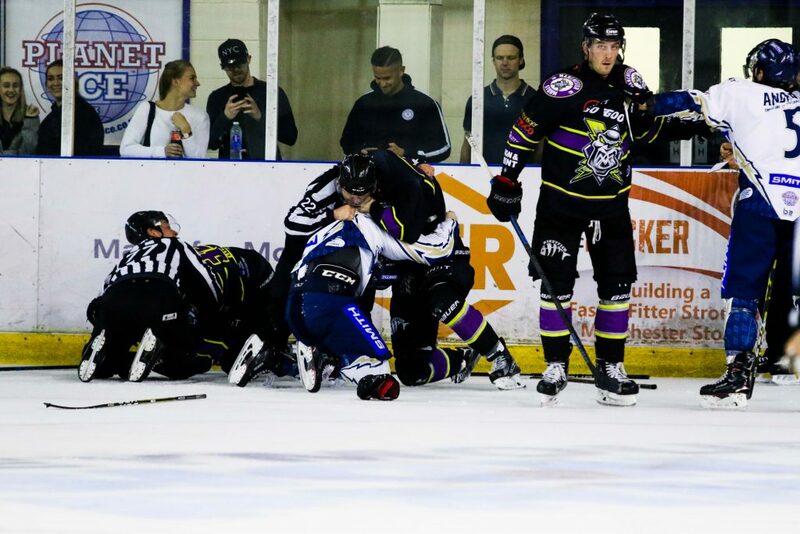 It was bad luck for Storm as Captain Dane Byers also took a coincidental penalty for fighting, plus a game misconduct. The start of the third period began tough, as Storm began to play what would have been the first five minutes short handed. Long took his chances on a short-handed breakaway but it went wide. Just short of two minutes in, Norris took a penalty for Lightning for goalie interference, making it 4 on 4 hockey. Overall, the third period was relatively clean, and end to end hockey. Long got another breakaway opportunity, to be denied by Killeen – who had a good game overall, receiving 29 shots. Ginn also had a good game, saving 34 out of 35 shots on goal. In the final two minutes of play, Killeen was pulled in favour of an extra player. Storm’s final goal was an empty netter, put in by Moffatt on the breakaway, leaving the closing score at 4-1 to Storm. Man of the match for Lightning went to #19, Georgs Golovkos. Man of the match for storm went to #21, Mike Hammond. Special Game: Armed Forces Discount for Belfast Giants Match!